I have been warning people about SCYTL every chance I get. Put simply, during a time of gross political corruption, is it a good idea to have a foreign entity, owned by investment bankers, electronically count votes in our Presidential Election that leave no paper trail and that has been hacked into at least one time that we know of already? "Of course not" you say? Yeah, well of course that means we are doing it. Is this why the military is not getting ballots? During one of the most hotly contested elections in recent U.S. history, the number of military absentee ballot requests is strangely down by staggering numbers compared to the 2008 election. The information comes as WND confirmed today that SCYTL, an international firm headquartered in Spain, has been contracted by seven states to provide secure online ballot delivery for overseas military and civilian voters for the upcoming presidential election. Michelle M. Shafer, SCYTL’s director of communications and government affairs, told WND that her company has been contracted by New York, Arkansas, Alabama, West Virginia, Alaska, Puerto Rico and Mississippi to provide the overseas ballots. She said the ballots will be delivered via online PDF files by SCYTL and not by the company’s U.S. subsidiary, SOE Software. In January, SCYTL purchased SOE Software, the leading U.S. electronic voting firm. Next month’s election marks the second time SCYTL will provide overseas balloting. During the 2010 midterm elections, the company was contracted by the Defense Department’s Federal Voting Assistance Program to support overseas military and civilian voting in nine of the 20 States that agreed to participate in the program. SCYTL was the provider with the highest number of participating states during that election. The Defense Department has been coming under fire after reports of an exponentially low number of requests for military absentee ballots this year compared to the 2008 election. The Military Voter Protection Project last week released the results of a study listing the number of requests in key states such as Virginia, where military absentee ballot requests are down 92 percent compared to 2008. In Ohio, only 9,700 absentee ballots have been requested as of late September compared to more than 32,000 in 2008. Florida so far has 37,953 requested ballots as of last month as opposed to 86,926 in 2008 – a difference of 48,973. North Carolina only has 1,859 requests listed compared to 13,508 in 2008. Just this week, a Military Times survey of military forces showed Republican nominee Mitt Romney with a 26-percent lead over the president. The Times survey follows an earlier Rasmussen poll that showed a 59 to 35 percent lead for Romney among military service voters. The low number of military requests perplex Republican lawmakers who in 2009 pushed and passed the Military and Overseas Voter Empowerment Act, which was supposed to make it easier for overseas military personnel to vote. The law required a voter assistance office at every military installation. It also automatically provides military voters with an opportunity to update their voter information during the check-in process at their duty stations. However, last month the Defense Department’s Inspector General reported that the Pentagon was not complying with the 2009 law, citing information that only about half of overseas locations had functioning voter assistance offices. In January, SCYTL, based in Barcelona, acquired 100 percent of SOE Software, the leading software provider of election management solutions in the United States. The press release announcing the acquisition noted that SCYTL is a portfolio company of leading international venture capital funds Nauta Capital, Balderton Capital and Spinnaker. With the purchase of SOE Software, SCYTL has increased its involvement in the U.S. elections process. SOE Software boasts a strong U.S. presence, providing results in over 900 jurisdictions. In 2009, SCYTL formally registered with the U.S. Election Assistance Commission as the first Internet voting manufacturer in the U.S. under the EAC Voting System Testing and Certification Program. 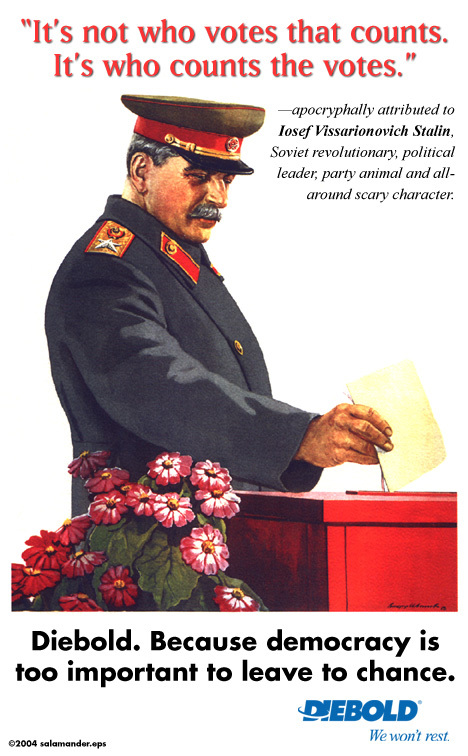 Also that year, SCYTL entered into an agreement with another firm, Hart InterCivic, to jointly market a flexible and secure electronic pollbook purportedly to allow U.S. election officials and poll workers to easily manage the electoral roll on Election Day in an efficient and convenient manner. SCYTL’s ePollBookTM already replaced the paper precinct roster in Washington, D.C.
During the midterm elections in November 2010, SCYTL successfully carried out electoral modernization projects in 14 states. The company boasted that a “great variety” of SCYTL’s technologies were involved in the projects, including an online platform for the delivery of blank ballots to overseas voters, an Internet voting platform and e-pollbook software to manage the electoral roll at the polling stations. The states that used SCYTL’s technologies during the 2010 midterms were New York, Texas, Washington, California, Florida, Alabama, Missouri, Indiana, Kansas, Mississippi, New Mexico, Nebraska, West Virginia and Washington, D.C.
Just prior to the midterms, Washington, D.C., tested its own new electronic-voting system and discovered it had been hacked. As a program security trial, the D.C. Board of Elections and Ethics reportedly encouraged outside parties to hack and find flaws in its new online balloting system. A group of University of Michigan students then hacked into the site and commanded it to play the school’s fight song upon casting a vote. This is not the first time SCYTL’s systems have been called into question. “Foreign governments may also seek to undermine the national security interests of the United States, either directly or through other organizations,” Voter Action charged. The document notes that SCYTL was founded in 2001 as a spinoff from a research group at the Universitat Autonoma de Barcelona, which was partially funded by the Spanish government’s Ministry of Science and Technology. SCYTL’s headquarters are in Barcelona with offices in Washington, D.C., Singapore, Bratislava and Athens. The system is vulnerable to attack from insiders. In a worst case scenario, the software could lead to (1) voters being unable to cast votes; (2) an election that does not accurately reflect the will of the voters; and (3) possible disclosure of confidential information, such as the votes cast by individual voters. The system may be subject to attacks that could compromise the integrity of the votes cast. Still, the Florida Department of State provided SCYTL with a Provisional Certification valid for two years certifying the company was “deemed compliant with the functional and security requirements.” SCYTL’s voting system was used during the 2008 presidential election. As WND reported, in May announced the successful implementation of technology that allows ballots to be cast using Google and Apple smart phones and tablet computers. SCYTL unveiled a platform that it says encrypts each individual ballot on a voter’s Google or Apple mobile device before the ballot is then transmitted to an electronic voting system. Using this technology “Scytl is now able to guarantee end-to-end security – from the voter to the final tally – not only for computer-based online voting but also for mobile voting,” stated a press release by the company. “By leveraging its pioneering security technology with Google and Apple’s mobile device platforms, Scytl has become the premier election technology provider to offer an online voting system that guarantees the highest standards in terms of both voter privacy and ballot integrity both on personal computers and mobile devices,” said Gabriel Dos Santos, Scytl’s vice president of software engineering. The U.S. currently does not utilize voting platforms using mobile devices. SCYTL sees such methods as the future of electronic voting.